Reel Talk Online: First Look: "Jumping the Broom"
First Look: "Jumping the Broom"
Hollywood is serving up yet another romantic comedy. This time it stars Paula Patton (Precious), Meagan Good (Eve's Bayou), Oscar nominee Angela Bassett, Tasha Smith (Why Did I Get Married? ), Mike Epps and a slew of other stars in Jumping the Broom. Reminiscent of the 1998 TV movie The Wedding starring Halle Berry, Jumping the Broom two very different families meet on Martha's Vineyard for prenuptial celebration, agony, and steamy revelations. Check out the trailer below. 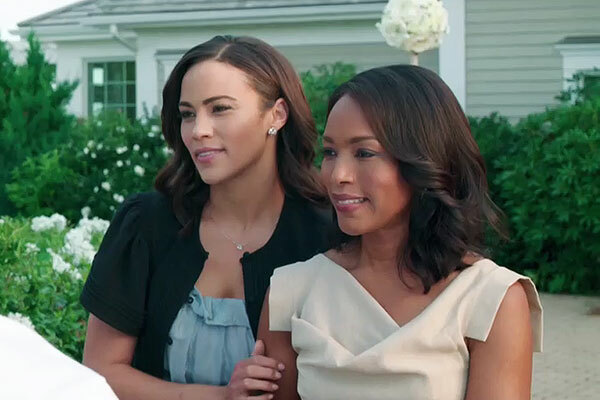 Jumping the Broom hits theaters May 6. I saw this trailer at the midnight for For Colored Girls! I was wondering what became of it. Sign me up! Love Loretta Devine, Angela Bassett (who still looks like she could play the bride-to-be, btw), and Paula Patton...and Julie Bowen is an added plus. Oh yeah, this is MY kinda of movie. Like Walter, I saw the trailer when I went to see For Colored Girls, but forgot about it. Definitely will be watching in the theaters.